ALTHOUGH at present the biplane seems to be the most popular type for use as a two-seater fighter, two or three monoplanes in this class have lately appeared. We have already ДальшеMore>>> described the Junkers K.47, which, fitted with the latest types of radial engines, has shown quite an astounding performance. The Do.C.4 described hereafter has a top speed of about 200 m.p.h. and an excellent rate of climb. 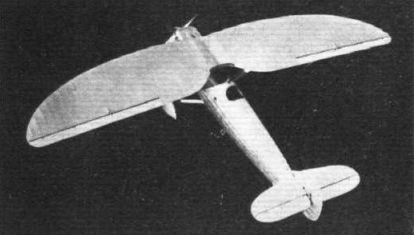 The machine is a high-wing semi-cantilever monoplane, the plan form of the wings being somewhat unusual, as may be seen from the accompanying photograph. Inboard of the attachments of the lift struts, the wings taper in thickness, improving the pilot's field of view. Three duralumin spars are used in the construction of the wing. One of these may be shot away without making the load factors inadequate for normal flying. Frise ailerons are fitted. Steel tubular construction is used for the fuselage, which is faired to an oval section. The empennage is of a conventional type except for the fact that the tail plane passes through the fin. The undercarriage is a well faired divided type. The pilot's cockpit is beneath the cut-out in the centre section of the wing. He is armed with two machine guns mounted in the cowling. Immediately behind is the well-sheltered observer's cockpit, with a mounting for twin guns. Any of a variety of engines may be installed, including the Rolls-Royce "Kestrel" and the Hispano-Suiza 12X type. Both the fuel and the oil tank may be jettisoned during flight. A MONOPLANE FIGHTER: The Dornier Do.C.4, which may be equipped with the Rolls-Royce "Kestrel" or Hispano-Suiza 12X engines. This view of the Dornier Do.C.4 monoplane shows the tapered wings.